Here are some pressure washing business cards that we’ve created for our customers who want to market their pressure washing business with a powerful offline marketing strategy. Here’s a set of pressure washing business cards we designed for Mineral Area Pro Wash. 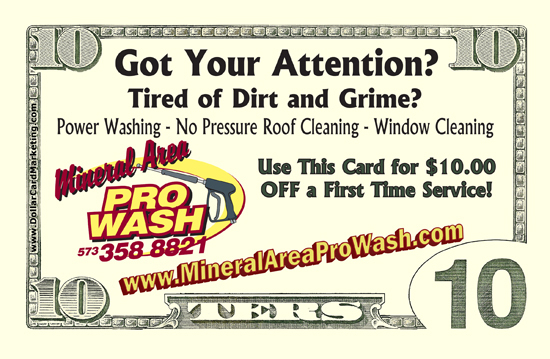 Mineral Area is using our cards as 10 dollar bill coupons for power washing service, roof, and window cleaning.